Ninety percent of everything is crap. A clear majority of homebrew adventures up on RPGNow are crap, too, and disappointing in fairly predictable ways – low page count coupled with low idea density and a narrow scope; the proverbial “twelve encounters in 18 pages” dungeon headed by a padded intro. These modules don’t really make it to this blog, because it’d usually break my heart to savage an obvious labour of love that just happens to be lacklustre, and because they are so alike it’d be dull to read and write about them. But I buy them and read them because one day, somebody’s dodgy PDF with an uninspiring piece of public domain art for the cover will turn out to be cool and awesome and worth all the slog. 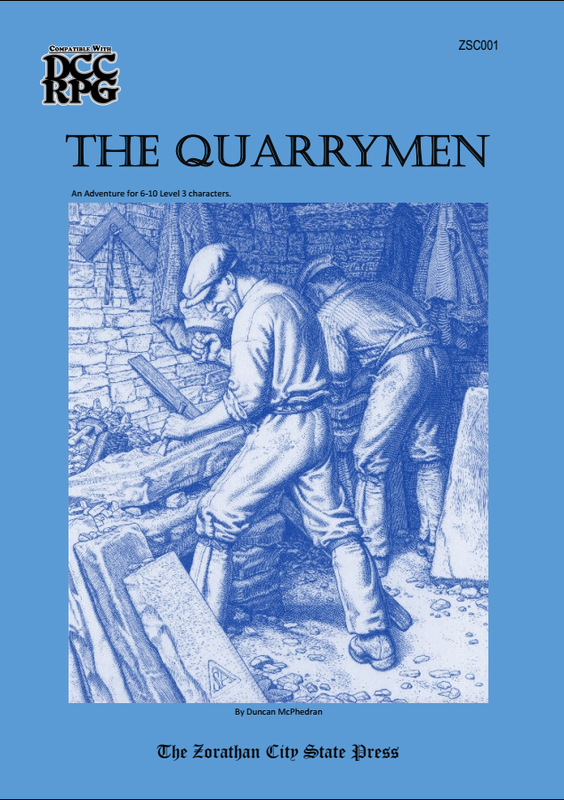 The Quarrymen (for the DCC RPG) is one of those modules. When I say this is a gem in the rough, I mean it. The production values are dire, and never mind the public domain cover art. The PDF was obviously cobbled together in Microsoft Word, badly. This is what happens when you leave the factory settings on, indent your titles, don’t give a hoot about structuring information, use no page numbers, and create your location key with the numbered list function. Accordingly, every keyed location is a single block of text instead of a series of paragraphs; and each one is broken up into read-aloud text (set in italics), monster statistics (set in bold), and underlined text for everything else in the room key. It all flows together without paragraph or line breaks, and the monster stats are embedded into the text just like that. Yes, it is just as terrible as it sounds, and while I am far from a layout snob, this took some time getting used to. But then we get to the adventure, and it is so great. 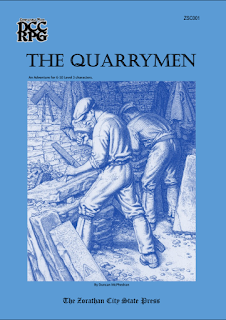 Basically, the town quarry’s sixty-six workers have disappeared through a tunnel among the rocks, and only the foreman has stumbled back to the surface, raving about “the Creature”, “jars, jars, jars, endless jars”, and “tentacles”. You go in to investigate. This is the first ray of hope, because all this background is two paragraphs long, followed by the Creature’s stats (basically a store-brand mind flayer), a few magic items, and then we jump straight to the dungeon key, which manages to pack a 37-area dungeon into 5.5 pages, with very generous margins. That’s respectable even if it is partly due to the limited layout. You could say some of the read-aloud text is superfluous, since it is a minimalistic thing mostly telling you what you’d read off of the map anyway, but it is not bad, because the rest is a ton of fun. You get the idea part of the adventure was randomly generated because the ideas are all over the place and they are fairly straightforward, but they have that dastardly GM spirit and sense of fantasy which makes a dungeon fun to explore. Here is an alcove full of dead bodies who might animate if you come close (coincidentally, they may do that if you try to flee the dungeon and block your exit). Here are a bunch of jars filled with internal organs… and here is a detailed table for what happens if the characters decide to scarf them down (yes, really – this was the point where I knew I had hit gold). Here is a lake of oil and here is what happens when you fall into it with your torch. The author took a Dyson Logos map, and just stocked it to the gills with exuberant, madcap stuff that often makes no strict sense except as dungeon encounters. It is not exactly balanced to be level-appropriate; if you die, you die. There are stone golems who will attack trespassers, but you can fool them if you wear some fake tentacles. There are five very dodgy handouts drawn by the author, and I kid you not, one of them is Cthulhu in the style of Van Gogh (no, really), and one of them, a tapestry, is Leonardo’s Last Supper, but with a mindflayer and a bunch of headless corpses slumped over the table. What the hell. I love it. Then the adventure goes from slightly random to “Aieeeee! Get it off me! Get it off me!” as we enter what could be best described as a high-tech Cthulhu outpost. It is bizarre, but not predictably bizarre – it is not, say, a Giger knockoff or a place with obvious parallels to our modern technology, but the kind of slightly unsettling place where the players will start asking each other if they really made the best decision coming down here. A lot of it is unpredictable, or just eerie. A row of vats with something indefinable floating inside them. A door whose “close inspection leaves you dizzy and vertiginous”. A dressing room where the mind flayer’s monsters put on strange coats and jackets to venture out into the city (I loved this one!). A mind flayer harem which is exactly as wrong as you’d expect. It feels like a proper mind flayer lair, certainly the best I have seen. Bad things can happen to characters here, and there is enough combat to turn it into an ugly slaughterfest; yet it also has a gleeful, grotesque sense of fun that fits DCC without copying its default heavy metal trappings. I don’t really want more from a small adventure than what this one gives me. Solid, unpretentious, sometimes goofy fun is all right with me, and the imagination is outstanding. Well, it may be a little on the linear side, but actually, you can even get around that if you are observant, and it is a one-session affair where a little linearity is forgivable. I certainly want to see more. The first issue of the author’s zine, The Cities Zorathi, has been more of a setting primer, and it was not really this interesting, but the second issue is supposed to feature “the first level of the Great Maze”, and if it is similar in style and scope, sign me up. No playtesters have been listed for this publication. It deserves to be played.